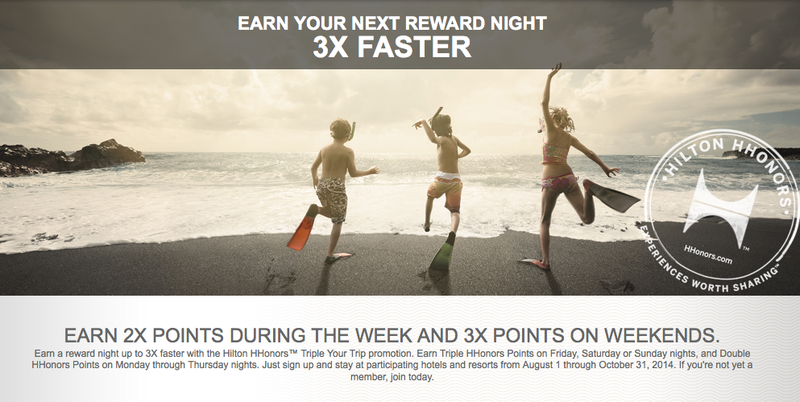 Hilton HHonors has released the details and registration of their next systemwide promotion that will kick in on August 1st after the completion of the current Earn Twice the Rewards promotion. This one offers bonus points on any night of the week and has no minimum length of stays requirement (ie 1 night is all that is required). Of course it looks at filling hotels that are typically less busy on weekends by offering a larger Triple Points bonus on Weekend Stays versus the Double Points on Weekday stays. Still for the road warrior who has HHonors as their primary program the Double Points is better than no bonus points. Once again there will be a list of non-participating hotels but that list is not available yet. One can assume based on past HHonors promotions that the majority of non-participating hotels will be in the U.S.
For a list of hotels that are not participating please click here. Can't make use of this promotion? Be sure to check out our HHonors Bonus Points page for many more offers!